The lens takes 49mm filters, comes with a petal-shaped lens hood, and is slated for delivery to dealers in December of 2011, for an approximate retail price of $1,000. The Sony 24mm ƒ/1.8 is very sharp indeed, even when used wide open at ƒ/1.8. It's not tack-sharp corner-to-corner at that aperture, but it offers a large area of central sharpness with only light corner softness. Stopping down doesn't provide much improvement until you hit ƒ/2.8, and corner sharpness improves dramatically; maximal sharpness is achieved at ƒ/4, where it's not quite tack-sharp, but for most purposes, it's close enough. Sharpness actually drops off slightly at ƒ/5.6 and smaller, but there's no noticeable impact until ƒ/11. The lens can stop down as small as ƒ/22, where overall image sharpness is somewhat degraded. There is some very light chromatic aberration present in images shot with the 24mm ƒ/1.8. It's visible as fringing in areas of high contrast: in the corners, this fringing is magenta in color, while in the central region of the frame, it's blue in color. It's more or less consistent regardless of the aperture selected. Light falloff really isn't in an issue with this lens, with the worst effect showing corners that are 1/3 EV darker than the center, at ƒ/1.8. Usually, we see barrel distortion in wide-angle lenses, but in this case there's actually some prominent pincushion distortion: -0.5% in the corners. The 24mm ƒ/1.8 uses an in-lens motor for autofocus, which is quick and near-silent. The front element does not rotate during focusing operations, making life that little bit easier for polarizer users. Offering 0.25x magnification, the 24mm ƒ/1.8 offers better-than-expected macro performance, with a minimum focusing distance of just 6 inches (16cm). The Sony 24mm ƒ/1.8 Sonnar T* ZA is a quality lens, nicely finished in a matte black finish. The lens feels very sturdy and fairly heavy, weighing in at 8oz: it's worth noting that the NEX-7 weighs just over 12oz, so for the camera platform it provides, this is a very light combination. The lens has only one control on it, the manual focus ring. The lens uses a metal body mount, and plastic 49mm filter threads. There is no depth-of-field scale, distance scale or infrared index. The focusing ring rests in the middle of the lens and is about 3/4'' wide - it feels like plastic, and is very smooth but quite tactile, making manual focus easy. The focus ring has a very smooth operation, and will stay where it is set. The NEX series of camera uses a fly-by-wire design, so there's no direct connection between the rotation of the focusing ring and the amount of focusing done; consequently, there are no stops, hard or otherwise, at the close-focusing and infinity end of the lens. The ALC-SH114 lens hood is included with the lens. It is a petal-shaped hood with a matte black interior that attaches with a bayonet mount; what is unique here is that bayonet mount is recessed inside the lens barrel. The hood stores reversed on the lens when not in use. When attached, the hood adds a little less than 1 3/4'' of length to the lens. The E-mount being a fairly new system, there aren't many alternatives to choose from here. One can only imagine that this lens is the inspiration for the new E-mount 24mm ƒ/1.8; we haven't yet tested this lens, but it is compatible with the NEX series of camera by using the LA-EA1 or LA-EA2 adapter. Sigma produces the 24mm ƒ/1.8 in a Sony alpha mount, so with the LA-EA1 or LA-EA2 adapter, it could be mounted on a NEX camera. In our testing, the lens didn't produce exceptionally sharp results (there was some pretty impressive corner softness) and chromatic aberration was quite high. 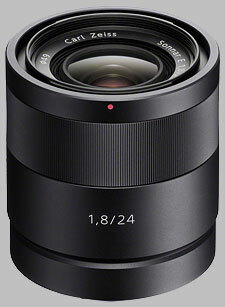 But it is half the price of the Sony 24mm ƒ/1.8. Considering the price, you would hope that the Sony 24mm ƒ/1.8 Sonnar T* ZA didn't disappoint - and happily, it doesn't. Sharpness is excellent even wide open, and other factors such as chromatic aberration, distortion and corner shading are well-controlled. The 24mm ƒ/1.8 proves to be an able companion to the NEX camera. Incredible resolution, even wide-open! Have yet to find any flare or ghost images in my pix - many shot into sun! Expensive, as it costs more than the body. The is a reason most photojournalist make a fast 35mm their go-to optic: It will cover most situations and most lighting conditions encountered. The 24mm Carl Zeiss works out to the same acceptance angle on the APC sensor of the Sony NEX cameras as a 35mm lens on a full-frame digital or film camera. Over the long haul and in the widest variety of shooting conditions, a prime lens will hold up better than a zoom. I know, as I have been using both since the zoom or vari-focal lens was invented. Magical color, light weight and sturdy, fast and very sharp at wide open. Price..........but you get what you pay for. I bought this lens as a walk around and street lens. 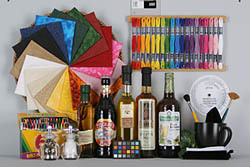 I has fantastic color that seems to give three dimensional properties to your images. I`s also very fast at 1.8 full aperture. Full open is sharp across the frame and gives very contrasty fotos, which is quite unique for a wide angle. It`s very light weight but sturdy and well finished. It comes with a nice plastic hood which fits well. Focus is fast and almost silent. 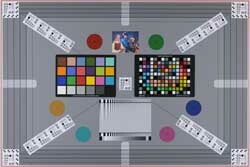 This is wat makes Zeiss famous and comparible with truly great lenses. If you can afford it`s high price, buy it!! nice build , lenshood metal/plastic, looks and feel very nice. sharp wide open, don't get better stopping down, verry good! fast af, ad macro slow/hunting on nex 5.